Each of these 6 weekly sessions before Easter will consist of a reading from Scripture, a period of meditation and a sharing on the Scripture. 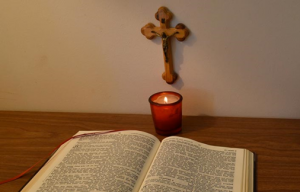 The Scripture reading will be from the readings for the Sundays of Lent so, apart from being a good Lenten practice, your understanding and appreciation of the Sunday readings will be enriched. It is through the Scriptures that we come to know the values by which we, as Christians, are called to live. Participants will discover that the Gospels are as much alive for them today as they were for the early Christians.